This travel article by Christine Dell’Amore appeared in The Washington Post. At our tour guide’s mention of scorpion spiders, an uneasy murmur rippled through the crowd. We were about to enter the labyrinth — a twisty dark corridor that weaves through part of the Camuy River Cave Park, a gigantic cave system in northern Puerto Rico. Large arachnids call this part of the cave home, and as my fellow adventurers and I felt our way through the blackness, I noticed a shadowy spot on a cave wall. As I squinted more closely, an arachnophobe’s nightmare came into focus: A spindly, fist-size scorpion spider — technically called a tailless whip scorpion — clung to the rock, sporting a set of long, spiny pincers. Actually neither scorpion nor spider, the animal looks fearsome enough for both monikers but is harmless to humans. My boyfriend, Brian, and I examined it by the glow of our iPhones, fascinated by this unique cave dweller. Perhaps the largest of Puerto Rico’s hundreds of caves, Camuy quickly captures you in its web of wonders. Rio Camuy, an underground river that’s been carving out the nearly 11-mile-long cave for millions of years, still roars beneath your feet, and the park’s “show” cave, Cueva Clara, or Clear Cave, is awe-inducingly enormous, with a ceiling about 17 stories high and hundreds of feet wide. Camuy — and much of northern Puerto Rico — is part of a karst geological formation, which consists of rocks easily eroded by water, such as limestone. And considering how impressive the site is, it’s surprising that scientists explored the cave for the first time only in the 1950s. 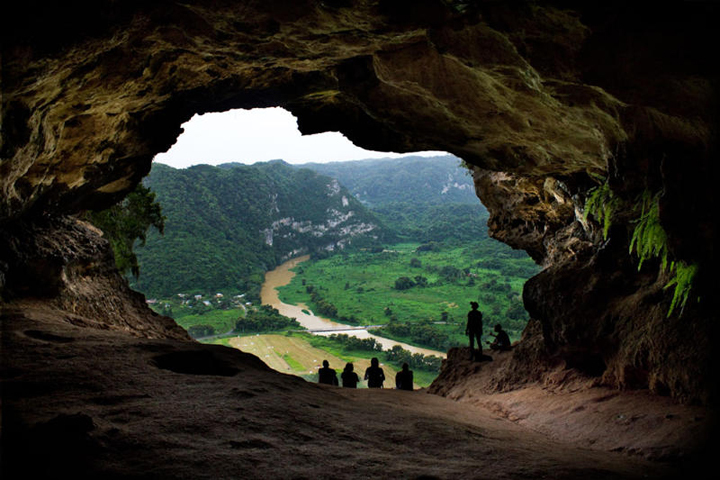 (Archaeological evidence shows that prehistoric Taino people had visited the cave over the centuries.) In 1986, the area became the 300-acre Camuy River Cave Park, a protected area of the Puerto Rico commonwealth that offers guided walks to tens of thousands every year. I was initially wowed by tourist literature saying that Rio Camuy is the third-longest underground river in the world — a fact I heard at the park itself — but when I contacted cave experts in Puerto Rico after my trip, they told me that’s an out-of-date statistic from the 1970s.